Anyone who has every worked on a farm or in a stable knows how hard it can be do clean the work areas. Farms and stables are considered to be very dirty and messy places to work in. 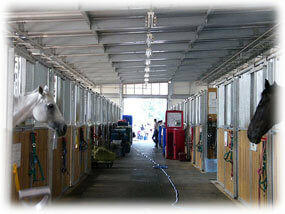 There is a way that can reinvent the way in which a farm or stable can be cleaned. Pressure washers are mechanical devices that use high-pressure, hot water in order to remove grime, mold, mud, dust and dirt from surfaces. Some of the surfaces that pressure washer’s clean best are farms, stables, concrete road surfaces, vehicles and buildings. This is a type of professional equipment that is capable of producing pressure of more than 2000 PSI. Basic types of pressure washers include a frame that contains the power source of a high pressure water pump, a motorized water pump, a trigger gun and a high pressure hose. Pressure washers can be used like the nozzle of a garden hose. The nozzle of the pressure washer increases the flow of the liquid coming out. Many pressure washers use a cleaning agent or detergent in conjunction with the stream of water to assist in the process of cleaning. A high pressure chemical injector and a low pressure chemical injector can be used. If you work on a farm or at a stable it is easy to see why pressure washers can be the ideal solution to many different cleaning applications. A farm or stable is notorious for collecting dirt and grime. Plus, the farming machinery collects grease and oil on both the inside and outside, and only a pressure washer can help with that kind of mess. Pressure washers can be custom designed to handle all of the cleaning needs of a farm or stable. Many farms and stables that use pressure washers can not believe the difference that this piece of equipment makes. There is a noticeable difference after just one cleaning session. Professional pressure washers that are the most ideal for removing grease and dirt are the hot water models. The hot water models are the best at loosening and removing not only tough stains but also other substances such as grease that seem impossible to remove. Make your farm or stable cleaner for employees, customers and the animals. Handle the toughest cleaning jobs with a hot, high-powered pressure washer. There is no other piece of cleaning equipment that can handle and do so much. Before operating pressure washers it is always important to read and operate the piece of equipment in accordance with the safety instructions. Pressure washers are excellent cleaning agents that should be used in a safe manner this is because objects that are in the water supply are ejected at high velocities from the nozzle. If you own a farm or stable make you’re cleaning process not only easier but faster. Clean your farm or stable in half the time when using a hot water pressure washer. Pressure washers are able to clean more effectively then any other piece of cleaning equipment currently on the market. Create a cleaner work environment by purchasing a pressure washer.